The winter holidays are dawning on us once more and the card competition is going on in the art classes. The classes have a competition to create a design for a winter or holiday themed card. The competition has been going on for over 11 years. Art students can submit card ideas from traditional mediums, graphic design programs like Illustrator, or taking holiday themed photos. The cards are judged, and the best ones are picked as the winners. 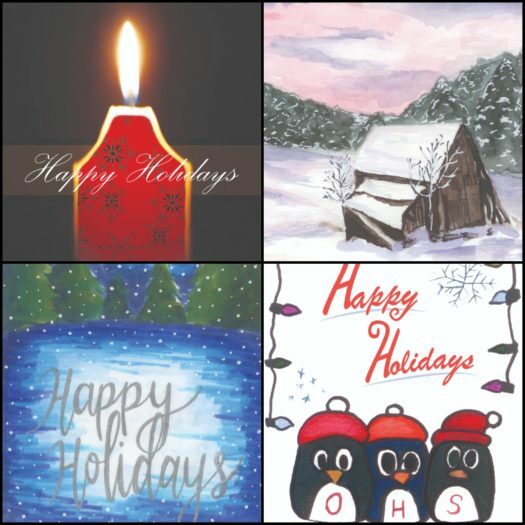 The winners’ cards are then printed out similar to normal cards you’d get at the store and given to OHS faculty and staff, local businesses and neighboring school districts. The winners of this year’s competition were seniors Ben Zytnowski, Brenton Berger, Molly Harris and Shelbi Walsh. Art II, Graphic Design and Photography teacher Kevin Olesen’s favorite part about the competition is that it showcases student talents and the fact that those talents get shown to other school districts. According to www.theclassroom.com competitions in education have positive benefits. One benefit is that it helps students learn to handle loss and to treat fellow competitors with respect even if they’ve done better than them. It also helps motivate some students now that they have something other than a grade on a paper to work for, in this case, their artwork being shown to the community. I know students don’t get a copy of the card, so the least I can do is wish you luck on your final exams. Happy holidays and have a great New Years from Andrew Armstrong and the rest of the Pirate Press crew.